I have always loved making my own t-shirts. Using a homemade freezer paper stencil to paint on fabric is a really cheap, easy way to do it. The awesome part? You can do this with any word, phrase or image that you can print and cut out with scissors. 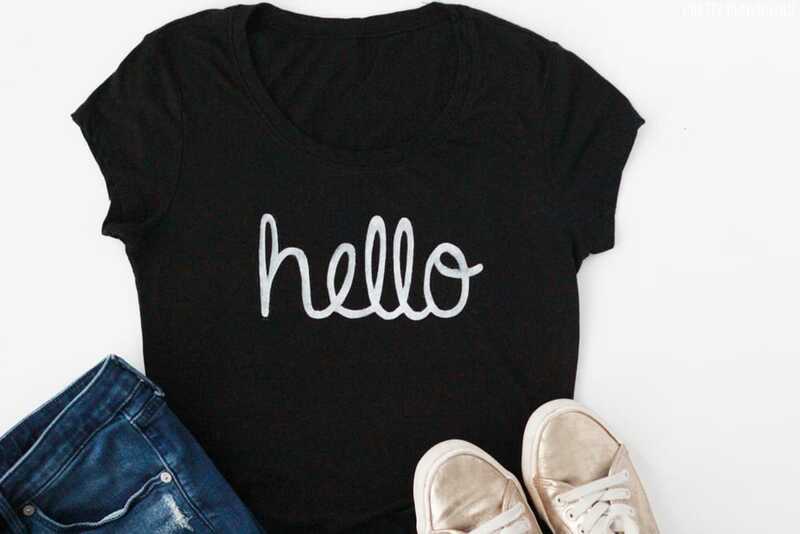 For this simple project, I found a plain t-shirt on sale for $5, printed the word ‘hello’ out, and then transferred that word onto a t-shirt in under 30 minutes! 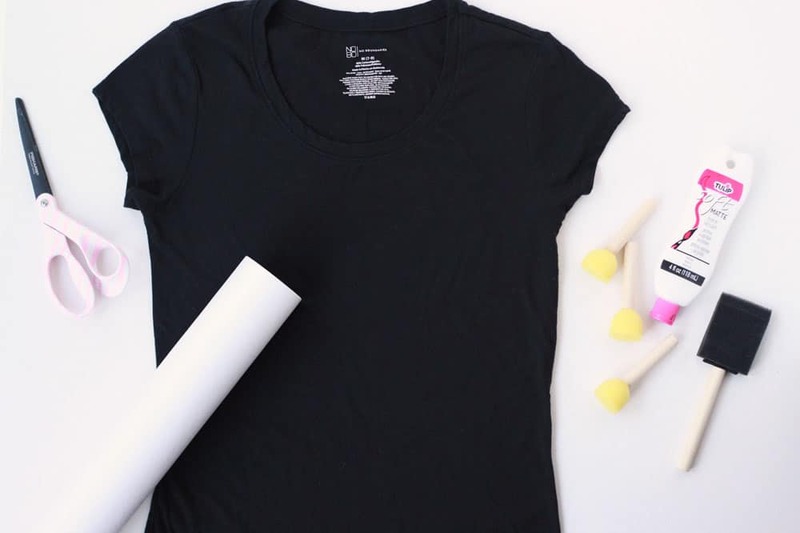 Watch how easy it is to make a freezer paper stencil and paint on a t-shirt. This project was so easy that now I have been going around my house looking for other things I can do this with. Sorry/not sorry in advance for how many freezer paper stencil projects I’m about to be doing. 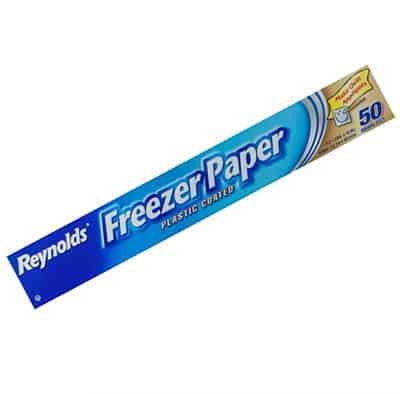 Freezer paper is thick paper with a wax coating on one side. Sometimes it is confused with parchment paper, which has no coating, or wax paper which is coated on both sides. Freezer paper used to be used commonly to wrap meat for freezing. I actually have never used it for that, only for making t-shirts! I like to buy it on Amazon, but you can find it at some grocery stores near the foil and other food storage items. 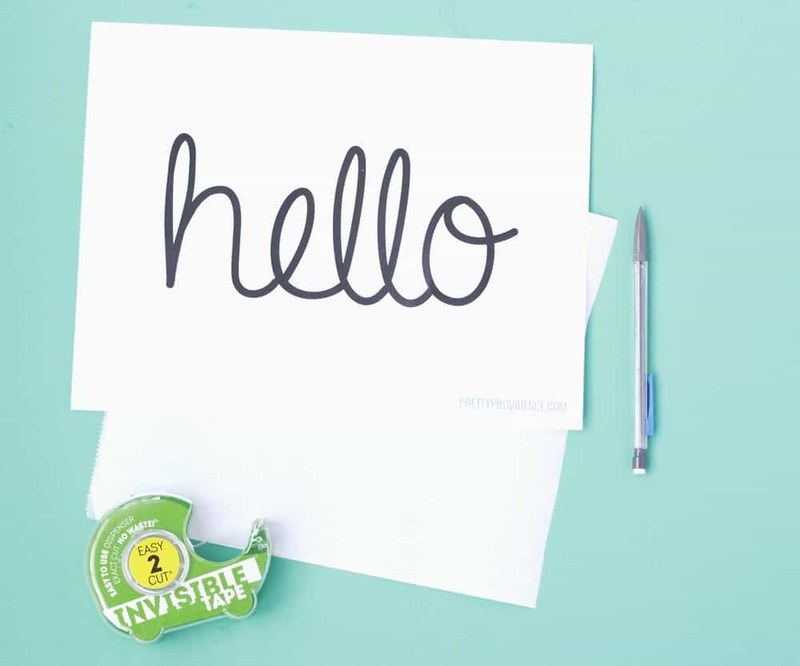 put a piece of freezer paper to the same size as your printout and place your hello underneath it with the waxy side of the freezer paper facing down, touching the printed paper. trace your design. don’t forget to trace the inside details of your letters too, you’ll need those. Place cardboard inside the shirt. This is to prevent the paint from seeping through to the back. Cut another piece of freezer paper and place that inside your shirt, on top of the cardboard with the waxy side facing UP. 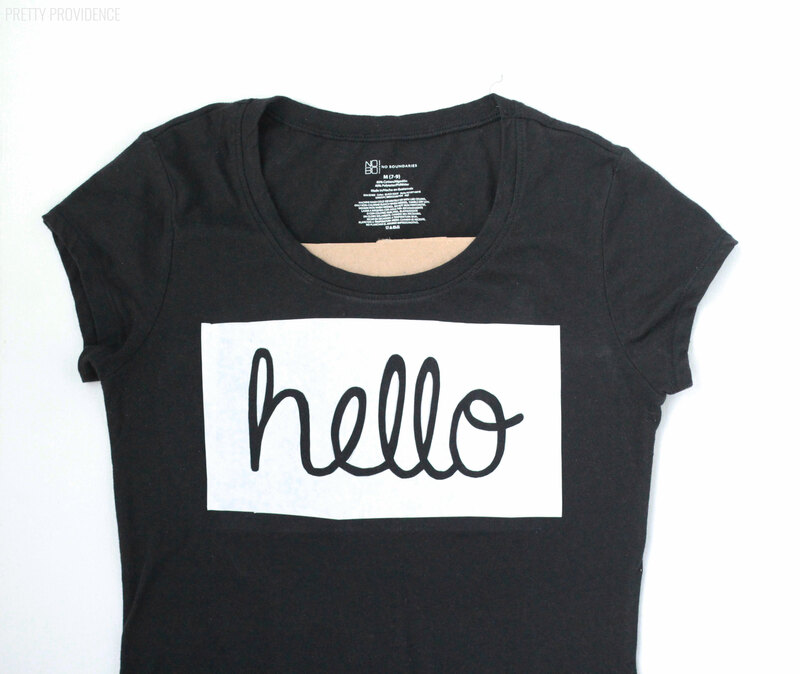 Place your freezer paper stencil with the design cut out onto your shirt. You want the design you’ll be painting to be exposed on your shirt. Do this with the waxy sides facing DOWN. Place them carefully where you want the design to be and iron it down. The two waxy sides of freezer paper being ironed together well is what makes the stencil work. Make sure the edges are really stuck! 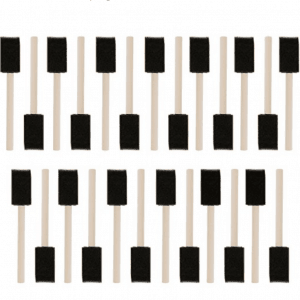 Using a sponge brush, apply paint onto the shirt over the freezer paper stencil. Be careful around the edges not to let the brush go under. Paint one coat, wait twenty minutes and do a second coat. Let fabric paint dry for a few hours or overnight. Remove stencil pieces carefully. What kind of paint should you use to paint on t-shirts? 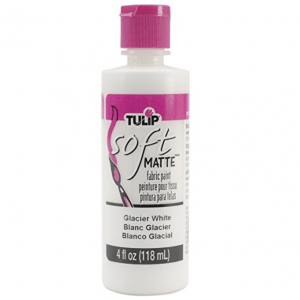 Fabric paint is best for painting on t-shirts, but another option is to use acrylic paint mixed with fabric medium. Going the second route will give you a lot more color choices! 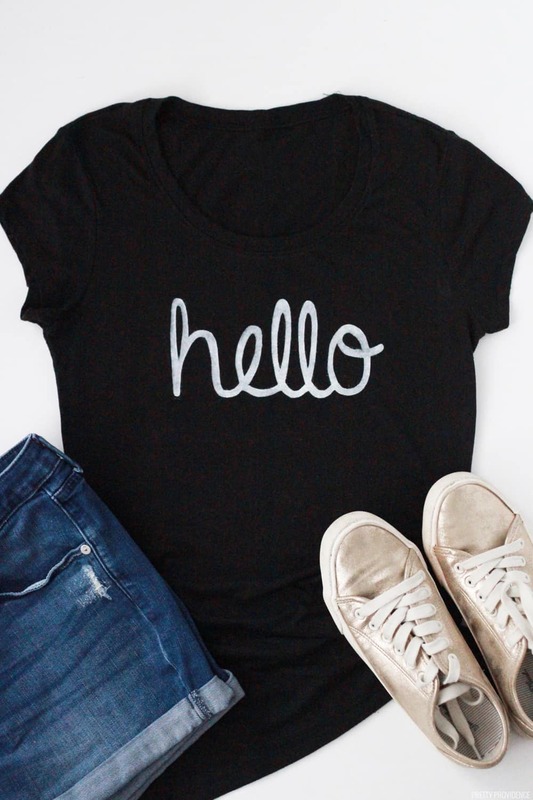 If you’d like to download the word “hello” like mine just click here. Rather do a different word but use the same font? I used a free font called A Gentle Touch. I can’t wait to see your creations! 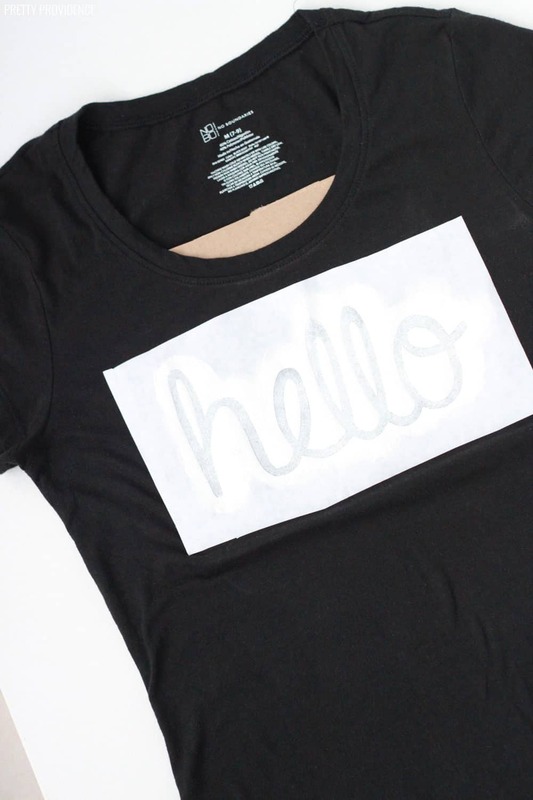 How to make a freezer paper stencil to paint on fabric, like a t-shirt or tote bag. You can also use freezer paper stencil on wood! trace your design. don't forget to trace the inside details of your letters too, you'll need those. 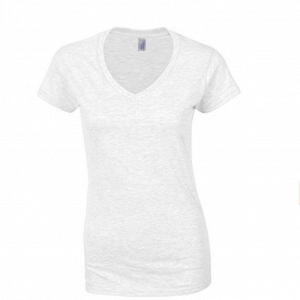 Place your freezer paper stencil with the design cut out onto your shirt. You want the design you'll be painting to be exposed on your shirt. Do this with the waxy sides facing DOWN. Place them carefully where you want the design to be and iron it down. OMG…this is too fun!! I didn’t realize how easy it was to make your own shirt!! I’m going to be doing this! Right!? It is so fun! Perfect for a quick craft night! Such a fun idea! I can think of all the shirts I want to make already! Thank you! Yeah, it opens all kinds of creative doors! What a fun idea! IM thinking we need these for a ladies day out for a birthday! Now to go get some wax paper! Yes! Freezer paper for the win! Ok, this looks like a craft even I could handle – and so dang cute! Yes! It’s so easy and fun! This is darling! I love it! Thank you! It was so fun to make! I’m making a Hawkeye shirt for my bff’s b’day! It’s turning out well! Yay! So glad to hear that! If you have to do a very large project, you can use Microsoft Publisher and print the image across multiple pages and then iron them down one at a time. Great on a quilt, or blanket, or 4XL shirts. Such a good idea!! Thank you! What about the wax? Does it wash out of the shirt? Does it stain the shirt? It doesn’t transfer onto the shirt, it just makes it stick but when you peel it off there is no remnant! Stack your paper before cutting it. – then you will only have to cut once to make 15 stencils. How does the short wash and dry w the tulip fabric paint? Or should I hang dry? In the area with the size, click the number, then erase what it says and type a number in. You can go up to, like, insanely large numbers. how you enlarge the font?? I have Microsoft word and it onlylets me go up to 72 which is not the size I want! 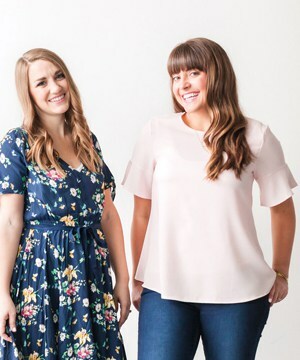 My sister and I love this idea! Thank you! Can you wash them regularly after you paint them? love this idea- would be fun to try different fonts and sayings!